In stock -This product will ship today if ordered within the next 9 hours and 59 minutes. 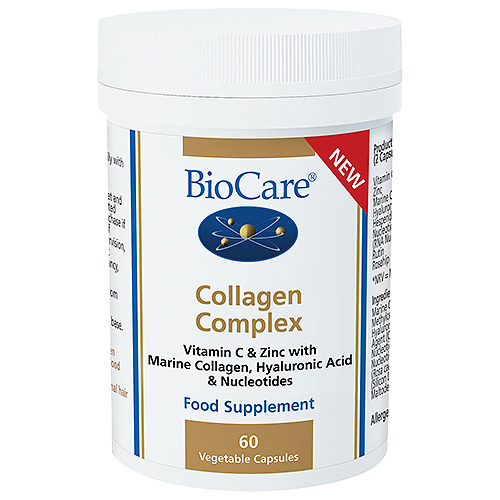 Vitamin C contributes to normal collagen formation for the normal function of blood vessels, bones, cartilage and skin. Zinc contributes to the maintenance of normal hair and skin. Marine Collagen (Fish), Capsule Shell (Hydroxypropyl Methylcellulose), Hyaluronic Acid (as Sodium Hyaluronate), Vitamin C (as Ascorbic Acid), Bulking Agent (Cellulose), Rutin, Hesperidin, Nutri-tide® IM Nucleotide Nutrition (Concentrated extracts of RNA Nucleotides from Saccharomyces cerevisiae), Rosehip (Rosa canina Hips), Zinc Citrate, Anti-Caking Agents (Silicon Dioxide & Magnesium Stearate), Maltodextrin, Inositol. 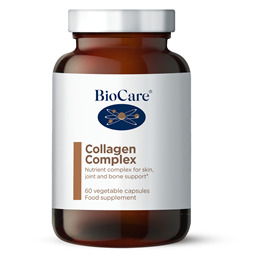 Below are reviews of Collagen Complex - 60 Capsules by bodykind customers. If you have tried this product we'd love to hear what you think so please leave a review.